When do I put out the food? On the second Saturday of May, just set out your non-perishable food well before your letter carrier’s normal pick-up time. 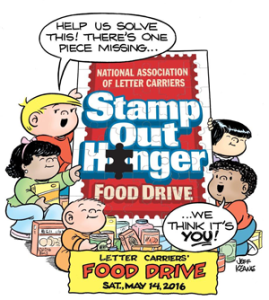 Note that he or she will be delivering and collecting mail as usual, on top of collecting food donations, so that pickup time could be slightly later than usual. What do you mean by “non-perishable food?” Click here for the list of non-perishable food items needed at the Dedham Food pantry. Is there anything I shouldn’t donate? Please do not donate frozen food, homemade food or home-canned items, or food in glass jars. In keeping with good food-handling and food-safety procedures, food that is opened, damaged, out of code or does not have the official ingredients included will be discarded by the food bank in the sorting process.